POS terminal market in India is registering healthy growth year-over-year. POS terminal market in India is buoyed by several factors mainly increasing penetration of plastic currency on account of financial inclusion initiative led by the Central Government under ‘Pradhan Mantri Jan Dhan Yojna' and a relentless drive of the Government towards cashless economy. The market is also witnessing significant demand owing to banks pushing to gain advantage in merchant acquisition business through procurement of large number of POS terminals. According to 6Wresearch, India POS Terminals Market size is projected to grow at a CAGR of over 16% from 2017 to 2023. In POS terminal market, portable POS terminal segment recorded highest revenue share in the overall India POS terminals market share in 2016 owing to its major deployment in several end user markets such as hospitality, government, and retail. Other POS terminals consist of countertop, mPOS, PIN Pad, and multimedia, wherein mPOS is registering positive growth year-over-year owing to its ease of accessibility and low cost of installation and availability on a monthly rental basis. 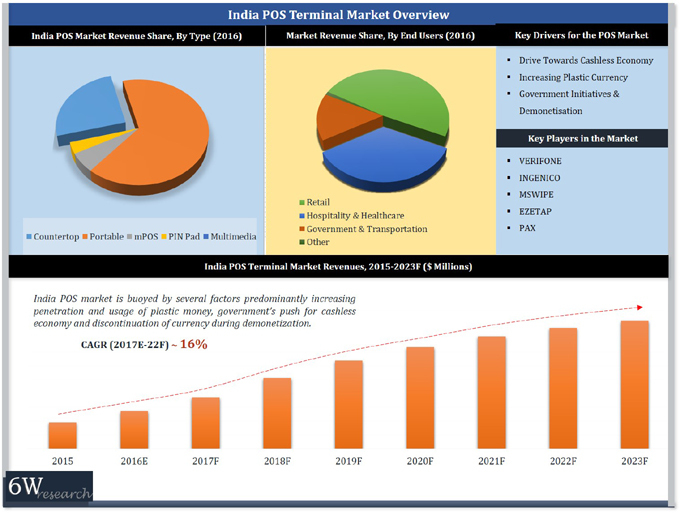 India POS Terminals Market report thoroughly covers India POS Terminals Market by type, end user, and region. India POS Terminals Market outlook report provides an unbiased and detailed analysis of the on-going India POS Terminals Market trends, opportunities/ high growth areas, market drivers which would help the stakeholders to decide and align their market strategies according to the current and future market dynamics.